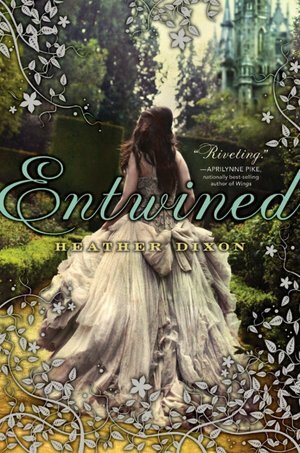 The title of Entwined is presented two ways – a sash dance in which the man tries to “entwine” his partner by the end of the music and in the malevolent magic that lies dormant in this retelling of the Twelve Dancing Princesses. Dixon gives her retelling considerably greater background. When the Queen dies at Christmas, giving birth to her twelfth daughter, grief splits apart the King and his daughters. He is devastated and doesn’t want to talk about his wife. The girls are ordered into mourning for a year – no going outside, the draperies are closed to shut out the light, all the girls’ dresses are dyed black, the clocks are stopped, and there is NO DANCING (dancing was an activity their mother loved, making her death doubly difficult). When the King leaves for the war front, Princess Azalea (the eldest princess and heir) and her sisters feel abandoned. By happenstance, Azalea finds a magic passage (opened with Mother’s silver handkerchief) leading to an enchanted crystal world minded by Keeper. 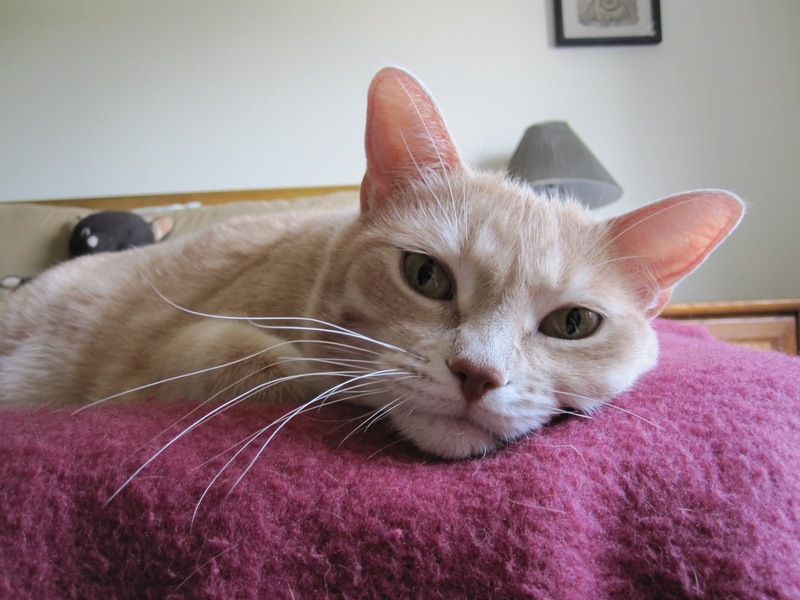 Keeper is handsome and genteel and allows the girls to come dance every night. In an act of defiance, the girls become the Twelve Dancing Princesses of fairy tales. It is their Secret, sworn in silver…until Keeper lets on his secret. It is dark and deadly indeed. The story has a very British-Victorian feel – Azalea is in some ways an analogue to Queen Victoria – although it is set in a make-believe European country. There are lots of cute, funny bits involving the younger sisters and the suitors who come to court Azalea (balancing the darker aspects of grief and revenge). While Azalea is talking to her (obvious, to all the readers) Prince Charming, she wants to give him toast – it’s such an innocent component to “I think I love him” but it expresses far more care than teen love usually does. As a dancer, I loved the endless different social and group dances Azalea teaches the sisters – walzes, schottishes, reels, tarantellas – on and on across different countries and time periods. It’s a part of dance history that so often gets lost so it’s nice to see the brief mentions throughout the book. I had quite a fun time with this book and it was perfect for snuggling up as the nights grow cooler. BBAW 2011: Catch you next year! The world of blogging is continually changing. Share 3 things you think are essential tried and true practices for every blogger and 1-3 new trends or tools you’ve adapted recently or would like to in the future. 1. Your own identity: write what you like, be who you want to be. 2. Use Twitter, tumblr, Plurk, what-have-you to spread the word about your blog. Ditto for understanding a little about SEO. 3. Make your blog easy on the eyes: garish text/background combos, auto-play music, and distracting animations make it hard to see your words. A customizable blog template. I can’t adjust any width on my current one – love the colors, my header, pictures, etc., but the columns are too damn narrow. It’s pretty annoying particularly when the plug-ins provided by Blogger are too wide for the column. Ready Player One seems tailor-made for those of us who fondly remember the 1980s. But it’s not a history book – it’s a dystopic novel set, for much of the book, in the virtual reality of the OASIS in 2044. Wade (aka Parzival) is a teenager who spends a great deal of his waking time in the OASIS. He goes to school there. He hangs out with his friend H there. And he searches for the keys hidden in James Halliday’s OASIS – keys that will make him the beneficiary of Halliday’s entire private fortune. For a kid who has barely anything beyond the clothes on his back (and a drug-addicted extended family), the Easter Egg hidden at the center of Halliday’s world is his ticket to fame, fortune, and getting the heck out of the stacks of Oklahoma City. But Wade isn’t the only one looking for this fortune – an evil multinational would like nothing better than to bend the free-expression reality of the OASIS to its corporate will and more privileged players than Wade use their considerable resources to go where he cannot. Now, Wade is an obnoxious, over-confident, potty-mouthed, blowhard of a teenage male. The chip on his shoulder is that big. He’s annoying. I didn’t like him very much for about a chapter or two. If I had been reading this in print format rather than listening to the audiobook while driving I probably would have stopped reading around chapter three. I have little brothers – Wade is just a more extreme version. But…the narrator of this book is Wil Wheaton. Yeah, that Wil Wheaton. His voice is absolutely perfect for Wade. He captures Wade’s me-against-the-world mindset perfectly. He changes his voice and accent very subtly for the other major characters. He makes you care about Wade’s crazy trek through what is essentially Indiana Jones in Myst (there are a few good twists and some total geek-out moments) and that’s what gets you to the amazing, super-awesome, crazy endgame of the novel. Every, single paragraph of this book is a love letter to the 1980s. It’s a geekfest/mystery/cyperpunk adventure across all cultural forms. Do you like Blade Runner? Atari? Video arcades? 80s movies? John Hughes? Quest games? Dungeons and Dragons? 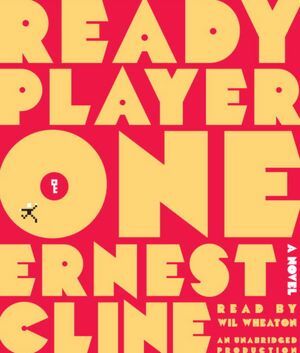 Definitely, Ready Player One is for you. Book bloggers blog because we love reading. Has book blogging changed the way you read? 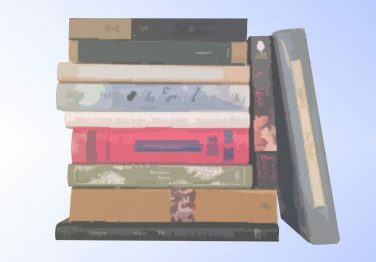 Have you discovered books you never would have apart from book blogging? How has book blogging affected your book acquisition habits? Have you made new connections with other readers because of book blogging? Choose any one of these topics and share your thoughts today! Blogging has definitely changed how I relate to other readers. Before, I was often the only person around who just didn’t see the hype in a popular book…now, I can find another kindred spirit (or two or three) who share my opinion. Or, conversely, I can find another champion for a book that jsut doesn’t get the love and respect I think it deserves. Other bloggers highlight books I might have missed or make me crazy with jealously when they have acquired a coveted advance copy (JennIRL and Ragnarok, I’m looking at you!). My acquision habits haven’t changed much (when you’re a bookseller, that’s the major transformation there) but blogging has brought me into contact with the great PR people at HarperCollins (particularly Erica Barmash with the “Olive” books) and I’ve found some really great reads through them! DON’T BE A JERK (It’s probably better to treat others as you would like to be treated). Otherwise, find something you like and write about it. If another blogger has an awesome meme or topic, give them credit in your post for the idea and then add your own opinions. Find the place where you can comfortably exist without feeling like you are obligated to do every challenge, contest, and meme that comes along. If you like having six challenges and five memes a week, go for it; if you don’t, it’s no big deal (trust me). Start small – big trees come from little seeds. Use tools like Twitter and Tumblr and Goodreads to help you find other bloggers and book-lovers and to spread the word about your blog (I’m on Ravelry, too, for the yarn addiction). For me, I went too big, too fast. The attempt to keep up with memes and challenges almost burnt me out the other year. I accepted a few too many review copies this year (thankfully, not a great deal but it makes me a little self-conscious for not getting them read and reviewed promptly). I had to admit that I couldn’t write two things at once – I coudn’t draft my book and write book reviews at the same time, I was hardly even able to read other books. Twitter is actually what kept me going, connected to the community while I went on an unexpected radio silence I’m still catching up to. I’m not shy about the fact that I post book reviews, movie reviews, pictures of my knitting projects, pictures of my cats, and just about whatever on my blog (althogh the majority of posts are about books in some way). That’s just me. 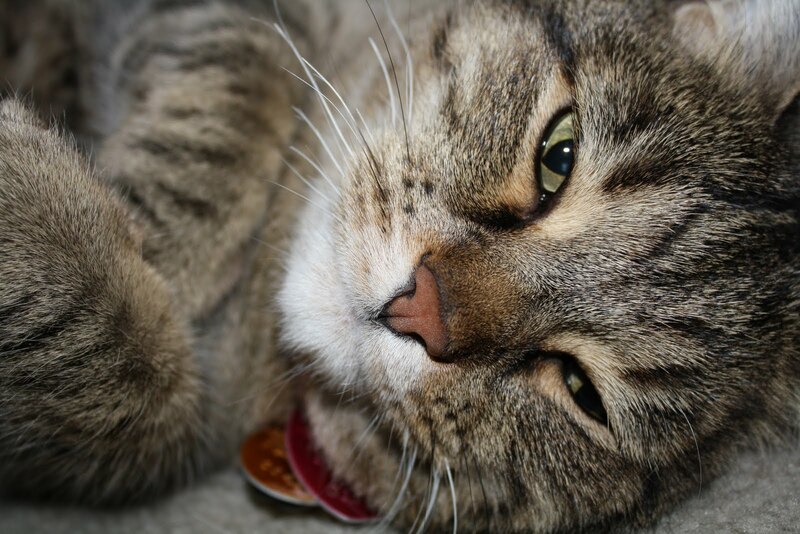 And it’s not Friday, but I think a gratuitous cat picture is necessary! Unavoidable laziness on “hump day”. Today is supposed to be interview swap day, but I didn’t participate this year because I wasn’t going to subject some poor, unsuspecting, and very nice blogger to the crazy that is my forgetful brain these days. INSTEAD, kitlings, I encourage you to peruse the Mr. Linky to see all the great swaps done by all the other bloggers then HIE YOURSELF OVER TO RAYCH’S GUEST POST. It’s tea-up-the-nose-pee-your-pants-all-sorts-of-wonderful. If it wasn’t obvious by my header picture, I love Lloyd Alexander’s Prydain Chronicles. They are nominally based on the Mabinogion of Welsh mythology. 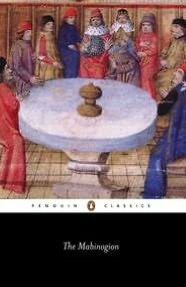 I’ve wanted to read the Mabinogion for some time, so I picked up the Penguin Classics edition years ago. Just never got around to reading it until now. And, needing further information for/distraction from writing the book, I started reading. First off, I will tell you that my good friend Kate lived in Wales during grad school and speaks a bit of Welsh. I visited and can speak no Welsh. I was incredibly happy that this edition has a lovely pronunciation guide for all the Welsh people and place names. Otherwise, I would have been emailing Kate left right and center. Second, it was such a treat to read a different take on the origins of King Arthur, King Mark, etc. Knowing that the Mabinogion (as it is known now) wasn’t collected or written down until after the rise of Christianity in the British Isles puts a different spin on character motivations and actions. It would be so interesting to see what the pagan origins of the myths are but we will likely never know since that religion waned before the tales were recorded. Amy gets top honors as a book blogger mentor. She’s like a den mom and cheeleader rolled into one. She’s a got a huge heart and serves as a reminder to all of us that we should do nice things for other people. She gets a big hug for being the driving force behind BBAW! Pam is the blogger I look to when there is an issue floating in the book blogger community. People who want to ban books beware – Pam will out you with a wonderful post encouraging all book lovers everwhere to stand up for the right to read. Her love of YA is infectious (#interrobangYA has to be the best hashtag and vlog idea I’ve seen in years) and has inspired me to read a little more YA, something I never did even as a YA. Rebecca is my go-to LitFic guru. She has fantastic taste, no lie, and if she decides a title is “pantyworthy” then I must go out and buy a copy to add to my “omg, read now!” pile. She has a great personal project – Fountain 360 in 365 – to expand her reading adventures outside her normal comfort zone. Additionally, she’s one of the three booknerd geniuses behind the Bookrageous podcast (iTunes link) (the other two are Josh and Jenn) and I look forward to every, single episode. Now, Aurora doesn’t quite have a straight-up book blog. She does review some things she reads but far and away what keeps me reading her blog is Aurora’s love of Jane Austen and how she translates her love of the time period into her passion for sewing. Aurora has travelled to Bath for the Jane Austen Festival (!!) IN COSTUME (!!!!). I love reading her adventures in classic literature and period clothing.